Join James Metzger, Marketing Vice President for Bizmatics, as he discusses how they significantly increased customer satisfaction with 8x8’s Virtual Contact Center when giving customers access to support on the channel of their choice.This success led them to expand their use of 8x8 Virtual Contact Center for their Revenue Cycle Management service department in order to provide a consistent customer experience across the various services they provide to their healthcare providers/customers.  How the company built a web centric support model to emphasize self-service when it makes sense with an easy transition to an agent on the channel of the customer’s choice when needed.  How 8x8 makes it easy for Bizmatics to help their healthcare provider customers focus on serving their patients and not have to worry about managing government organizations, insurance companies or nagging patients for copayments. 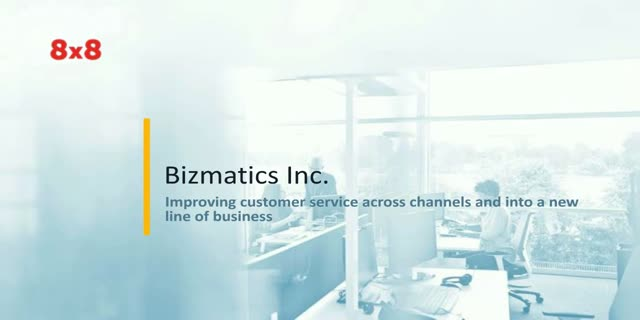 Learn how Bizmatics has made customer service a competitive differentiator for their business, and how they are now using 8x8’s Virtual Contact Center to make their Revenue Cycle Management offering more competitive. By tracking and recording key calls 8x8’s VCC helps Bizmatics ensure the right payments are made at the right time so their provider customers can have a reliable revenue stream that ensures the success of their business. The latest release of 8x8's award winning UCaaS product, Virtual Office, brings a fresh interface, new features, and additional functionality. Join us for this 30-minute 8x8 LIVE online session as 8x8's Channel Sales Engineer, Robin Alkein, walks through how to demo the new Virtual Office and win the deal. Do you know what to do to get ahead of the competition? Come and view a demo of Virtual Office. Sales Engineers to help your customers grow their business. With UCaaS products from 8x8, you can quickly and affordably meet your customer’s business goals, whether it’s adapting to a changing competitor landscape, achieving business growth, or even reaching new clients. Learn how 8x8 technology can help you close business. David Rowlands - 8x8 UK, Contact Centre Director. Businesses today have a huge amount of data at their disposal, but are they making it work for them? With the typical business storing information from various sources in different places, the challenge is collating this into a usable form that is also cost-efficient. This is crucial, as having genuine insights into your customers’ behaviour is critical in understanding how to delight them and keep them as brand advocates. What you don’t know, you can’t change, and this session will explain how analysing existing data streams can find solutions to problems you may not have realised existed. David is responsible for the 8x8 Contact Centre portfolio in the EMEA region, with a passion for using technology to find solutions to business issues. With over 20 years’ experience in the integration of Voice and Data techniques to marry applications to events and drive down transactional costs and increase efficiencies, David has been recognised as a leader in his field. David was the owner and founder of ICT Associates, winning the BT Voice and Data integrator of the year for his work in the design and deployment of Public Sector contact centres. He used the skills learnt to drive down costs for the private sector and featured in the Open Universities Business School as an exemplar of business techniques. Cloud services are taking over. Once bleeding edge, many mainstream businesses have gone 100% cloud - from communications to email to customer service. Join us as we share the story of one of them - Platform Specialty Products (PSP), a provider of specialty products and technical services. Dr. Stan Yarbrough, global IT lead for PSP, will discuss what issues to anticipate and how to prepare for the transition to the cloud, from organization awareness to technology change. Get the surprising insights from a new survey on trends related to cloud migration in the Contact Center Industry. Join independent analyst and industry expert Sheila McGee-Smith and Neha Mirchandani from 8x8 as they discuss trends in the contact center industry that are revealed by a new survey of CCNG members and other contact centers that look at the biggest challenges Contact Centers face today as well as drivers and challenges organizations face when they consider a move to the cloud. •39% of premises based Contact Centers plan to migrate to the cloud in the next three years. •The three largest drivers for a migration to the cloud for a contact center are as follows: business continuity, scalability and lower cost. In addition to the survey results, Sheila will provide insight into customer care market innovation that make a cloud contact center decision the right choice to meet today’s requirements and a shrewd investment to prepare for the future. Neha will also take a closer look at some of the surprising outcomes from the survey. It's no secret your users tend to use the communications tools they are most comfortable with even when they are consumer tools unsanctioned by IT. Sure, you've researched, selected, implemented, and support the best of collaborative tools to give your users anytime, anywhere, any device connectivity to each other. But even so, they still ignore IT's efforts and run back to what they like, leaving IT with no visibility into how the business is collaborating, and no ability to enrich the user experience while improving business productivity. So, how do you build a collaborative office that allows IT to remain in control of it all? Managing salespeople is no easy task. Distributed teams, long sales cycles, and inconsistent opportunity recording make sales oversight difficult and can take time away from actually selling. How can you get a better picture of day-to-day sales activity while still meeting sales objectives? Christie Nader, Vice President of IT, MHM Services & Alon Waks, Vice President of Product Marketing, 8x8, Inc. When working with state and governmental agencies, it can be tough to navigate the communications divide. With ever-changing requirements and fast-paced IT landscapes, how do you keep up with your organization's demands and streamline your communications? Join this webinar to hear how MHM Services, a mental health expert, tackles the ever-changing requirements and IT landscape to deliver the highest level customer service. See how 8x8’s unified communications help alleviate headaches and enable MHM to connect with over 6,000 clinical, managerial and administrative professionals nationwide. Charles Bender, Director of IT, Beach Trading Company & Alon Waks, Vice President of Product Marketing, 8x8, Inc.
Beach Trading Company is a leading online retailer of cameras, video, home entertainment and other consumer electronic products. To enable business growth, IT management needed to replace their outdated, legacy PBX, which could only handle 46 calls at a time. The company was at a cross-roads: find another on-premises solution, go hybrid, or make the leap to cloud. Attend this live event to hear from Beach Trading Company's Director of IT, Charles Bender, where you'll learn how your business can go from outdated to modern in less than two months. Gain insights on how analytics-driven customer communications can help your business grow and how multi-location businesses can reduce costs while scaling and adopting mobile excellence. Sales managers have a dilemma. They want representatives on the phone tracking down leads, qualifying prospects, and closing business. But they also need activity reports and forecasts to manage sales operations and forecast performance. How do you get one without sacrificing the other? -Free sales reps from tedious opportunity logging and recording. -Provide greater visibility into the sales funnel and day-to-day activities. -Optimize your sales organization and operations for greater productivity. More productive agents improve customer relationships and make a more productive contact center. And training, coaching, and feedback make more productive agents. Quality Management for 8x8 Virtual Contact Center is the easy way to monitor, measure, and evaluate agent performance. It integrates smoothly with your 8x8 Virtual Contact Center, so it’s easy to setup and use. And you can manage agents wherever they are located: in the contact center, a remote office, or at home. Enterprises are increasingly considering Unified Communications as a Service (UCaaS) as the basis for their communications infrastructure strategy going forward. But some have been reluctant to commit to a pure cloud approach from the start, so they pursue a hybrid strategy—with some users migrated to the cloud while others remain on legacy premises systems. Is this really the best strategy? Or does hybrid offer the worst of both worlds—partial outsourcing while still requiring significant internal resources to manage legacy gear and its integration with the UCaaS service? This webinar will lay out the advantages and the industry trends toward UC in the cloud, and will feature expert opinions on the issues that a hybrid approach may add to a UC strategy. You’ll come away with an understanding of why hybrid cloud isn’t necessarily the safe or easy choice, and whether a migration to 100% UCaaS can be a better option. This webinar explores moving UC to the cloud, the advantages of a full UC-as-a-service (UCaaS) deployment, and the issues a hybrid approach injects into the mix. Join us and learn how companies that have moved 100% to UCaaS have benefited. What does it mean to have an enterprise-grade cloud communications solution? Many providers may claim to offer it, but not all can deliver. And if always-on, reliable and global communications are mission-critical for your business, you need to ensure your cloud provider is making the "grade". Those seeking a way to replace outdated or disparate legacy systems across multiple locations. Your customer’s experience with your support organization has a huge impact on their impression of your brand, their loyalty, and on how much they will spend with you through the years. Most companies are aware of the need to improve their customer journeys but they don’t have the information they need to know what to do. In addition, your agent’s journey impacts your customers as well. How efficient is your agent? How much time do they spend looking at the wrong screens, trying to keep the customer busy while he scrambles to find the right information? What is the mindset of your agent when they talk to a customer? Are the focused on helping the customer or scrambling in the background to get to the information they need? Businesses should be tracking and managing both journeys in order to become more successful. But this is easier said than done. Join Aphrodite Brinsmead of Ovum Research while she share insights into the customer journey from her new research looking into the customer journey, what causes trouble and what has less of an impact. Max Ball from 8x8 will join to share some new innovations that make it easier to track the customer journey and to help ensure your agents are as efficient as possible. If your phones and other communications services lack proper security you may be exposed to the threat of fines, or worse yet, a serious breach. Don’t get caught off guard. Make sure you are fully compliant with HIPAA rules and regulations. Did you know it's your responsibility to verify the compliance of your communications vendors as well as yourself? Find out what this entails and much more during our live webinar. With 8x8, you really can have it all. We’re the only cloud-based provider that offers you world-class business phone services, collaboration and virtual meetings—plus enterprise ready contact center solutions—in one secure, reliable Unified Communications Suite. 8x8 is an award-winning hosted VoIP solutions from 8x8 deliver mobile, flexible, affordable, cloud-based communications, helping you serve customers anytime, anywhere, and on any device.